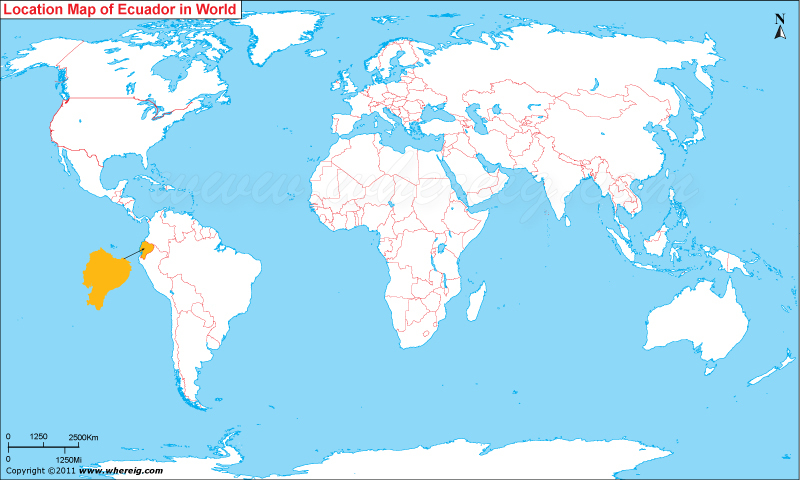 About Map: Map showing location of Ecuador in the World. The Ecuador location map shows that Ecuador is located in the north-western part of South America continent. Ecuador map also shows that it shares its international boundaries with Colombia in the north and Peru in east and south. However, the country makes coastline in the western part with Pacific Ocean. Apart from the mainland, Ecuador has also a small group of islands in the Pacific Ocean i.e. Galapagos Islands. It lies about 1,000 km west from the mainland. Map of Ecuador shows that the Equator cross through the country; probably, the name of the country has been given after it. Ecuador's capital city is Quito, which is one of the best places in South America and also tourists destination. It has been declared a World Heritage Site by UNESCO in the decade of 1970s because of having the best preserved and least altered historic center in South America. However, Ecuador's biggest city is Guayaquil. The historic center Cuenca is the third largest city in the country; it is also declared a World Heritage Site in the year 1999, because of being a wonderful example of a planned inland Spanish style colonial city. The government type of Ecuador is a presidential republic. Due to diversified topography, Ecuador has various types of climate including Humid Subtropical Climate in the coastal region and Rain Forests in lowlands.